You are here: Home>Archive>Days of Pride Collection.>Collection of items relating to Arthur Lewis Lloyd.>Letter from Lewis Lloyd to his mother. Letter from Lewis Lloyd to his mother. 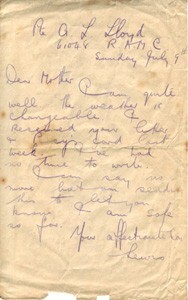 Letter from Lewis Lloyd to his Mother dated Sunday July 9th. He says he has received her letter and Percy’s card and that he doesn’t have time to write more and is sending this to let her know he is safe. 1 page. With original envelope addressed to Mrs WH Lloyd. Stamped ‘FIELD POST OFFICE 70 B JY 11 16’ and ‘PASSED FIELD CENSOR 1686’. Collection: Days of Pride Collection. Group: Collection of items relating to Arthur Lewis Lloyd. Item: World War One British War medal. Item: World War One Victory medal. Item: World War One 1914-15 Star medal. Item: World War One memorial plaque. Item: Letter from Lewis Lloyd to his mother. Item: Letter from Lewis Lloyd to his aunt. Item: Letter from Lieutenant Colonel Anderson Meaden RAMC 141st Field Ambulance to Mr Lloyd. Item: Letter of condolence from the King and Queen. Item: Letter from E.J. Boyce Headmaster of the County School, Wolverton. Item: Slip of paper with details of date of departure. Item: Envelope addressed to Mrs W.H. Lloyd. Item: Letter from the R.A.M.C. Office of records sent to Mr W.H. Lloyd. Item: Letter from Private John Martin to Mr W.H. Lloyd. Item: Letter from W.L. Harnett Vicar in Rural Dean. Item: Letter from H.J. Hippsley, Headmaster of Wolverton Boys School. Item: Copy of a page from a war diary. Item: Photograph of Lewis Lloyd in uniform. Item: Photograph of the headstone for A.L. Lloyd. Item: Slide of Lewis Lloyd. Item: Slide of World War One memorial plaque. Item: Slide of the headstone for A.L. Lloyd. Item: Slide of a book page showing an entry on Private Arthur Lewis Lloyd.